View of Sheene Bridge in County Kerry, Ireland. Kerry is located in south west Ireland and is famed for its beautiful landscape and tranquil lakes. 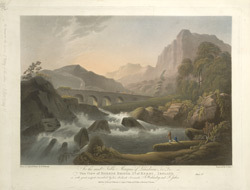 The river Sheene or Sheen, is well known for its dramatic falls near Kenmare which are depicted in this aquatint. The River Sheen rises in the Caha mountains and flows through the valley to Kenmare Bay.